Synopsys has introduced a portfolio of IP and supporting software optimized to address the security, wireless connectivity, energy-efficient and sensor-processing needs of Internet of Things (IoT) applications such as wearables, smart appliances, metering and wireless sensor networks. “We’re not just slapping an IoT label onto our IP,” said Ron Lowman, strategic marketing manager for IoT at Synopsys. The IoT IP portfolio includes power- and area-efficient logic libraries, memory compilers, non-volatile memory (NVM), data converters, wired and wireless interface IP, security IP, processor cores and an integrated sensor and control IP subsystem. It has been developed with TSMC to target the foundry’s 40nm ultra-low power process, and will also be applicable to the 55nm process, following feedback from customers that TSMC is their preferred choice for IoT designs. The TSMC ULP 40 process will accommodate both the Bluetooth and embedded flash IP in a single flow. “This IoT platform will help designers take advantage of TSMC’s 40nm ULP process and quickly ramp into volume production for the rapidly expanding IoT market,” said Suk Lee, senior director, design infrastructure marketing division, TSMC. Specific steps taken to address the energy-efficiency and area improvements necessary for low-cost, always-on IoT applications include the development of near-threshold, ultra-high density logic libraries operating down to 60 per cent of nominal operating voltage to cut power consumption, and thick-oxide logic libraries to ensure low leakage for always-on functions. “We think IoT will drive [the search for] energy efficiency harder than mobiles have,” said Lowman, adding that many customers want their IoT devices to be able to work for at least two weeks without recharging. Synopsys has developed high-density, low-voltage embedded memory compilers for use in IoT applications that use small bit cells, and offer integrated test and repair functions to support the use of embedded flash. The portfolio also includes power- and area-optimized 12bit/14bit 5Msample/s SAR data converter with low power modes, for applications such as blood glucose monitoring that need the extra resolution of a 14bit converter compared to a 12bit version. The relatively high conversion rate is said to be useful in controlling power conversion applications, but can be slowed down to save energy in applications that don’t need the higher rate. USB 1.1 and 2.0 interfaces are available, with the USB 2.0 PHY having been moved ‘back’ to the 40 and 55nm processes from the more advanced process node for which it was developed. Other interface options include MIPI CSI-2 and DSI interfaces, and a range of NVM IP. There are also IP blocks, acquired from Silicon Vision, that have in-chip transceiver matching networks, and which will operate at down to 1V when implementing the Bluetooth 4.0, 4.1 and 4.2 low-energy communication protocols. This core has already been proven on the 55nm process. The portfolio is rounded out with configurable 32bit ARC embedded processors and EV vision processors, and Synopsys’ sensor and control IP subsystem. Enhancements have ben made to the ARC EM core with an extended DSP instruction set and support for XY memory, to speed up matrix math operations, and shadow registers for fast context switching. 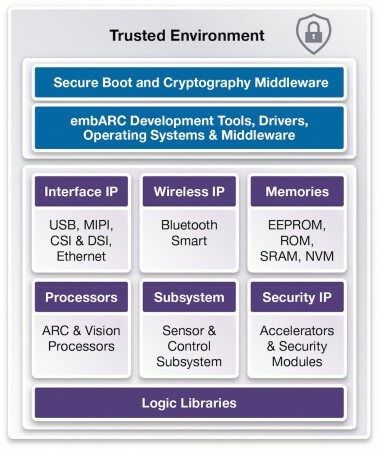 Commercial and open-source tools and software with which to develop ARC-based embedded systems for IoT include Synopsys’ MetaWare Development Toolkit and MQX RTOS, and support for the GNU toolchain and Linux kernel. The embARC Open Software Platform gives ARC software developers online access to free and open-source software commonly used to develop IoT applications, such as MQTT, CoAP, FreeRTOS and Contiki OS from the embarc.org website. 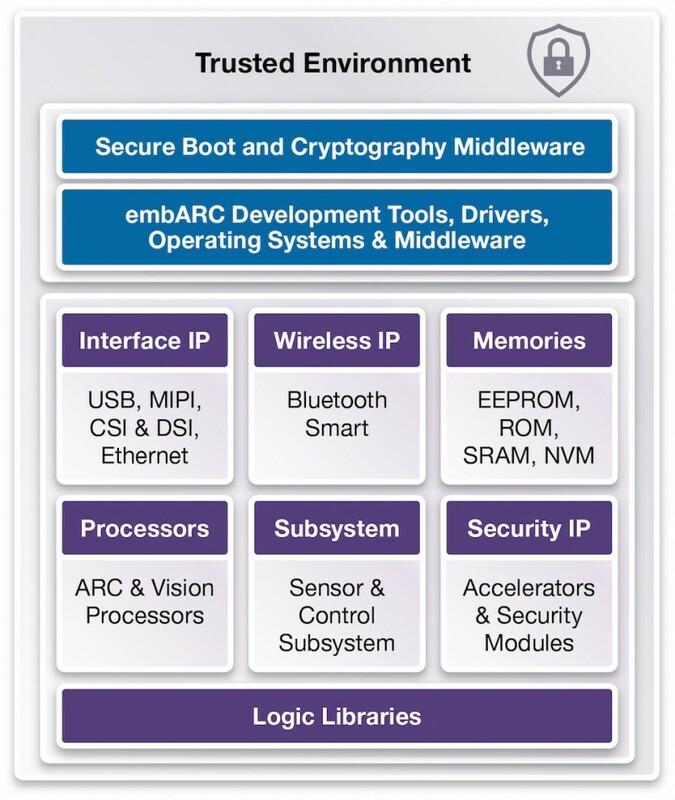 Synopsys also partners with embedded hardware and software vendors to provide developers with commercial tools, drivers, operating systems and middleware through the ARC Access Program.